The deal by OPEC and non-OPEC countries to extend output cuts is unlikely to lead to any fall in crude inflows into Asia from the region’s main suppliers, who will ensure they keep their key markets well supplied as they strive to maintain market share and limit the prospect of the region being flooded with arbitrage cargoes. Market participants and experts were of the view that the move by OPEC and 11 non-OPEC producers to extend production cuts by nine months — a move that would keep nearly 1.8 million b/d of crude oil off the market through March 2018 — would not be big enough to throttle the supply strategy of major exporters and prevent them from meeting the needs of their traditional Asian buyers. Takayuki Nogami, chief economist at Japan Oil, Gas and Metals National Corp (Jogmec), said some OPEC producers in the Middle East won’t be able to afford to reduce supplies to Asia — instead they may boost shipments to meet peak demand needs. “We may see an increase in supplies, even without an increase in production in the summer,” he added. Some traders said that it could be a testing moment for OPEC producers to maintain their output cuts as agreed, as they battle for market share in Asia amid the approaching peak demand season. OPEC and non-OPEC producers agreed in Vienna last Thursday to extend the current oil output cut deal by nine months to the end of March 2018. The original deal calls on OPEC to cut 1.2 million b/d, while the 11 non-OPEC participants committed to 558,000 b/d in cuts, from January through June. The trader added that if Middle East producers start to cut supplies to their key Asian buyers, they may lose out to the competition. “They will start to get lesser number of customers and lose market share,” the trader added. As Asia enters its peak refinery turnaround season, traders dismissed the possibility of any big impact on their prompt crude procurements, adding that the effect from the January-June production cut agreement was largely limited. Traders said they would be keeping a close watch on the extent to which OPEC and non-OPEC producers would adhere to their production cut commitments ahead of the approaching summer and winter demand seasons. Nogami added that some Middle East producers’ compliance with production cuts could be tested from as early as June as they may try to meet cargo demand for August-loading programs. If not then, compliance could be seriously strained from around October for November loadings, as the winter demand season kicks in. Any increase in oil production by OPEC’s Middle Eastern producers in the coming months could have an impact on the currently narrow spread between the Dubai and Brent benchmarks in the second half of this year, pushing it back out, Nogami said. In addition, the Dubai/WTI spread could also be narrowed by increasing US crude exports to the Pacific and the Atlantic, which may support WTI prices ahead, he added. OPEC crude output in April averaged 31.85 million b/d, flat from March, an S&P Global Platts survey found, with the group still showing high compliance with its production cut agreement as increases in Angola and Nigeria were offset by declines from Libya and Iraq. In the wake of the OPEC/non-OPEC production cut deal, Asian refiners have begun to diversify their crude slates, following the narrowing of the Dubai crude benchmark’s spreads against WTI and Brent prices. 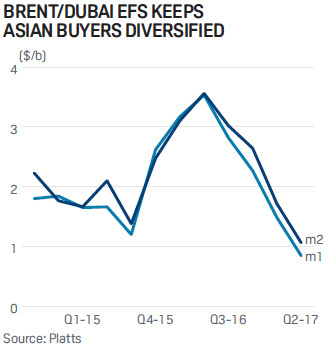 The Brent/Dubai Exchange of Futures for Swaps, a key indicator of ICE Brent’s premium to benchmark cash Dubai, has been narrowing sharply this year as OPEC cuts tightened supplies of Middle Eastern medium, heavy sour grades, thereby raising their values against light sweet crudes in Northern Europe. The second-month EFS has averaged 86 cents/b in the second quarter to date, down from $1.49/b in Q1. This is down from an average of $2.31/b in Q4 last year and significantly lower than the $3.10/b average in Q1 and $3.54/b average in Q2. “Asian buyers have diversified their timing of purchasing crude. Before, they used to only focus on purchasing Middle Eastern crudes mid-month to end-month [for two months forward]. But now when they are offered arbitrage cargoes, typically CFR cargoes with good economics and the price is cheaper than Middle Eastern crudes. They will consider to take those cargoes and adjust their requirement for Middle East cargoes,” said the North Asian crude trader. US crude exports slowed in March after hitting a record of exporting more than 1 million b/d in February, as domestic crude price discounts to Brent and Dubai widened significantly. The spread between front-month Dubai crude swap continues to command a premium to the same-month WTI swap for most of this year, with the spread averaging at $1.37/b so far in the second quarter and $0.51/b in Q1 against an average discount of $1.62/b in Q4 last year. A weaker WTI versus Dubai crude typically makes various North, Central and South American crudes priced against WTI more competitive.